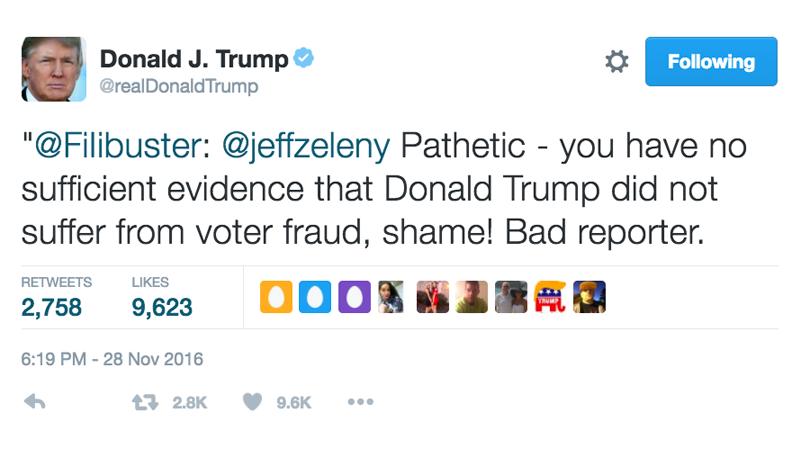 In one of his first acts of charity as President-elect, Donald Trump manually retweeted a teenager in California on Monday to shame CNN’s Jeff Zeleny for questioning his baseless allegations of extensive voter fraud. “Pathetic - you have no sufficient evidence that Donald Trump did not suffer from voter fraud, shame!” wrote 16-year-old “Seth” in a message to Zeleny later quoted by the President-elect. While Trump regularly retweets his supporters to chastise his critics, Seth is perhaps the youngest social media user the future commander-in-chief has turned to while trying to express himself. Speaking to Gizmodo, Seth said that getting retweeting by the President-elect felt “incredible” and he was “still in shock.” Asked if he’d accept the position of Secretary of State under Trump, Seth said he would if he were eligible. “At this age, obviously not,” said Seth. “I’d leave it to someone who’s a little more knowledgable, haha,” he added, clearly taking a cue from the man who will soon control the most powerful military in the world. Additional reporting by William Turton.